Haitians simply love to eat "koupye" called pourpiers in French. 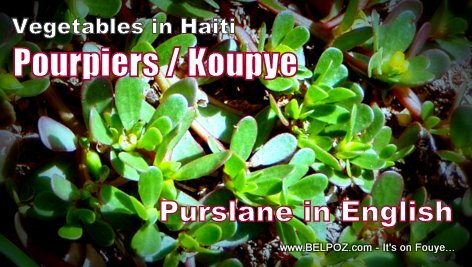 In English koupye is called purslane. They call it wild purslane (Portulaca oleracea), perhaps because it grows wild just about anywhere anout 2 months into the goring season. Not only is purslane a delicious vegetable, purslane is also an amazing medicinal plant. We will discuss the great health benefits of koupye / pourpiers or purslane in the articles that will be listed below.